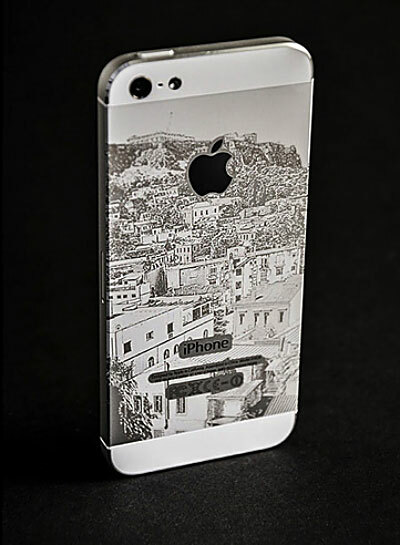 This example of an IPhone personalized by an Epilog Laser comes from the Epilog Laser website. GOLDEN, CO. – With an eye toward producing lasers for the masses when it was founded in 1988, Epilog Laser (www.epiloglaser.com) is well along the way to meeting that goal 30 years later. Almost all industries embrace lasers, and the short list includes artists, engravers, jewelers, sheet metal fabricators, plastic molders, wire formers, spring makers, guitar makers, cabinet makers, wedding planners, medical device makers, trophy makers, and many more companies. Epilog's sweet spot after 30 years of evolving its machines and improving quality has become its industrial engraving speeds and high precision at an affordable price. "Your only limit is your imagination," Epilog said on its website. At its most basic, manufacturers are using Epilog lasers to create serial numbers and bar codes. They etch logos. At its most complex, people use lasers to cut, decorate and create art. People use lasers to engrave awards and trophies, to engrave photo frames and cabinetry, to make signs, engrave beer mugs, wine bottles, labels, and to customize personal electronics. "There is nothing better than making your tablet, phone or other item a true one-of-a-kind item by customizing it with your own design. Whether it is a photo from vacation, your company’s logo or just a design that shows off your style," Epilog said on its website. 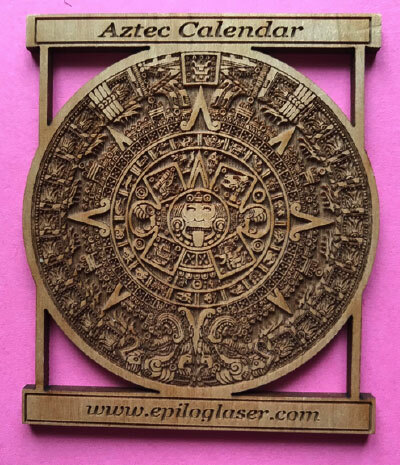 Epilog's the laser company people see at trade shows demonstrating its laser's ability by etching a replica of the Aztec calendar stone into a quarter-inch alder board. The original, an intricately carved 24-ton circle with a 12-foot diameter, sits in a Mexico City museum, but Epilog's equally detailed version goes home with people who tuck their 2.5-inch replica into their show bag. Epilog Lasers work with numerous graphic software packages including CorelDraw, Illustrator, Photoshop, AutoCAD, and others. his 2.5 inch wooden replica of the Aztec Calendar Stone is a tiny example of the precise detail Epilog Laser creates with its devices. This replica is typically handed out by Epilog staff demonstrating a laser at a trade show. Epilog offers a range of laser options, including the Epilog Zing Starter series, for low cost, small format, high quality engraving. The machine is 100 percent designed, engineered, and built in the USA. The Epilog Legend series is roughly 30 percent faster than the Zing series for the highest-quality engraving and cutting of wood, acrylics, plastics, stone and more. Like Zing, it is 100 percent designed, engineered and built in the U.S.A. The next series is the Epilog Fusion M2 Laser series that offers the fastest engraving and cutting speeds. The Epilog Fiber Laser series offers customers the ability to etch and mark all types of bare metals and plastics. The controller allows the user to laser directly from any graphic software program for easy job setup and customers can etch an entire table full of parts at one time. The Epilog G2 Galvo Laser series is a fiber laser with a workspace that can be adjusted from 4 inches by four inches up to 16 inches by 16 inches to its largest setting, 24 inches by 24 inches. It can engrave into most metals and it can mark engineered plastics. One reason the Epilog laser is gaining traction in manufacturing is the brand's precision. The accuracy of the lasers is to within 0.001 inch over the entire table. Another reason is a company or school can customize their electronic devices for greater security and personality. "Companies and universities are looking for ways to secure their employee and student laptops by marking each device with an ID number and logo. You can offer this service for all types of organizations," Epilog said.